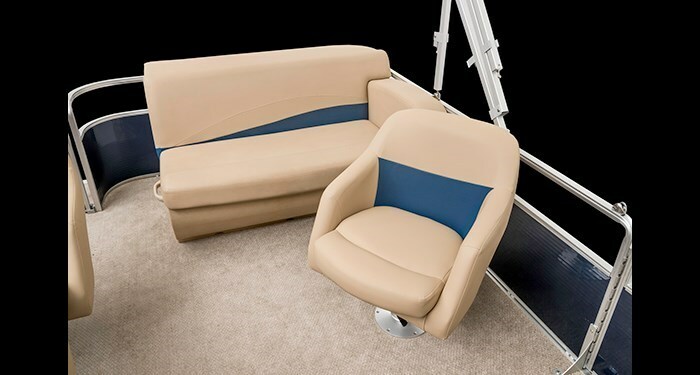 Omni is a brand new series of three models for Harris® of Fort Wayne, Indiana, a Brunswick Corporation company, and builder of pontoon boats for over fifty-five years. The three Omni models, 160, 180, and 200 are seventeen, nineteen, and almost twenty-two feet respectively in length overall. Specifically, the Omni 180, subject of this review, is nineteen feet, four inches on an eight foot, three inch beam. For 2015, Harris® offers a total of nineteen models in six series from seventeen to over twenty-seven feet with an incredible total of approximately one hundred floor plan availabilities. The Omni series, including this Omni 180, is available with three floor plan configurations. In Harris’ words, “This all NEW series from Harris combines affordability with legendary reliability and quality.” Let’s explore this new model. There are three very appealing exterior fence colours available on the Omni 180, Black Sapphire, Champagne, and Midnight Blue to combine with a choice of three fence accenting colours, Black Sapphire, Platinum Silver, and Sandy Pearl. Standard flooring is Boca carpet and standard dark furniture covering is Desert Camel with Ivory Cashmere optionally available if your taste prefers a lighter colour. There is a myriad of optional flooring looks and material available from Berber or Cognac carpeting to full or rear-only vinyl covering, full or rear-only Teak or Driftwood Teak vinyl, plus full or rear-only Woven Diamonds or light or dark Woven Teak. 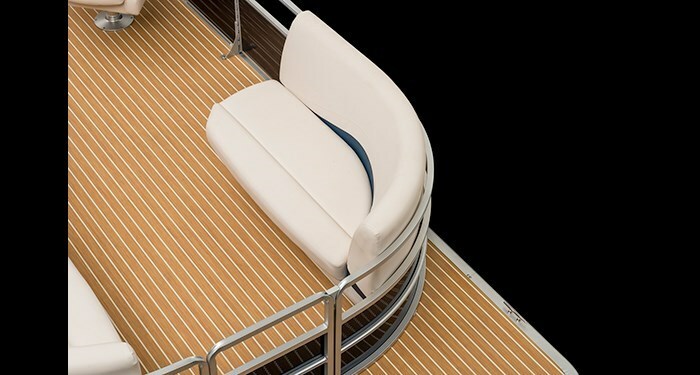 The standard ABS (Aft Bench Seat) floor plan features a center walk-through gate to the bow deck, a swim-deck access gate on the starboard side at the stern, a port side access gate, and a two-seater aft portside corner bench seat. There are also two facing bow lounges; a two-seater on the portside and a three-seater on the starboard side ahead of the driver’s helm. A standard removable table with molded-in drink holders is centered between these facing bow lounges. 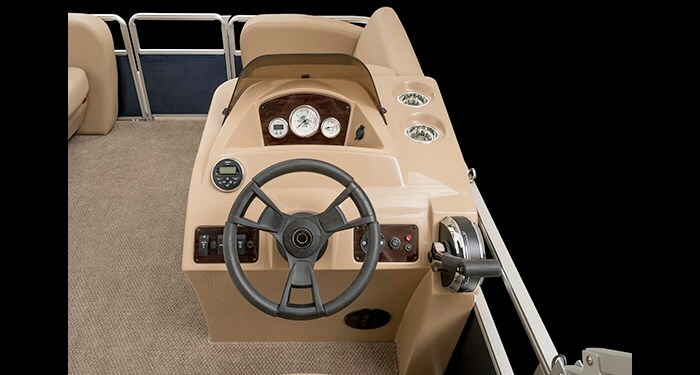 In addition to this, the Omni 180, in this layout, comes with two adjustable bucket seats, one at the helm and one on the portside just aft of the gate. The helm and bow seating remain identical in all three floorplan configurations. 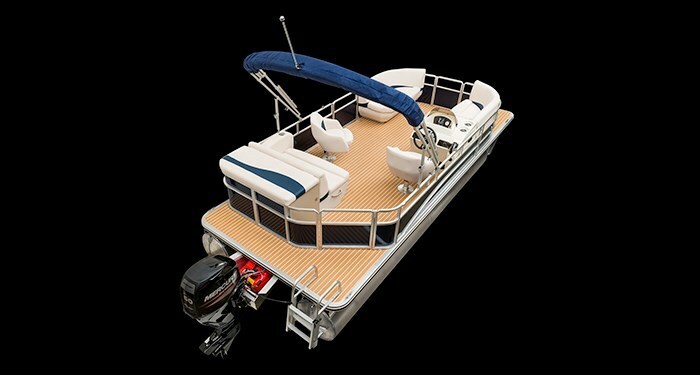 The optional “CS” (L-Group) floorplan configuration replaces the aft portside bench seat and the portside bucket seat with an L-shaped lounge. The optional “CW” (Center Walkthru) floorplan moves the stern access gate to the centre of the stern fence thus providing a “centre walkway” from bow to stern, adds a lounge along the port side from the portside gate to the stern, and adds an elliptical table on the starboard aft corner diagonally from behind the driver’s helm to the center stern gate opening. All lounge and bench seating provides storage beneath the seat cushions. A removable, tinted windscreen tops the molded driver’s helm console and additional storage is provided within this console. A speedometer and trim gauge are standard as is a 12-volt receptacle and a Jensen® stereo with two speakers. Also standard on the Omni 180 is an eight-foot bimini top with storage boot and a 3-step, fold down stern boarding ladder. 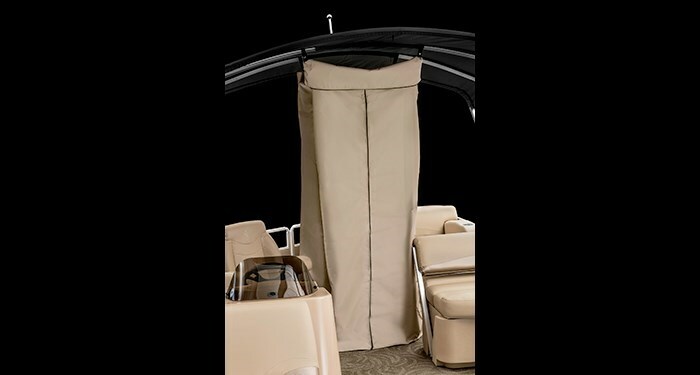 A reusable transportation cover is optionally available as is your choice of a full mooring cover or tan canvas seat covers. A wide range of Mercury® FourStroke outboard motor possibilities are available from a 9.9 horsepower up to the boat’s maximum rating of 60 horsepower. You could even choose a Torqeedo 4.0 Cruise electric motor, but this is only available with the CS floorplan layout and would of course require additional batteries. Motors up to 40 hp have a 6.6 gallon portable fuel tank, and above that require the optional 24 gallon fuel tank upgrade which also includes a fuel gauge. 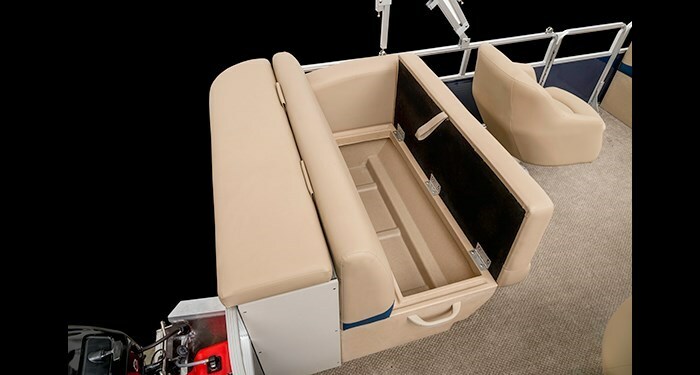 Notable additional optional equipment for the Omni 180 includes a change room with curtain which rolls up and stores from the support hoops under the bimini top, docking and courtesy lighting, a soft-sided cooler, portable wood-grain cup-holder, gate floor stops, a 4-step stern boarding ladder, stainless steel ski-tow bar, two additional speakers, and at the helm, a tachometer, a digital depthsounder or GPS/Fishfinder/depthsounder, tilt and/or hydraulic or Xtreme steering, Touring steering wheel upgrade, and a helm storage door. You can also choose full length extruded pontoon keels. A Convenience Package option includes certain of the above individual options.